Cool Egg Shaped Chairs for Your Home! Have you ever seen a cool egg shaped chair before? I had never seen them before and I was stunned! I kept imagining a cool living-room with a couple of egg-shaped chairs on it! They are perfect for any modern home design ideas! 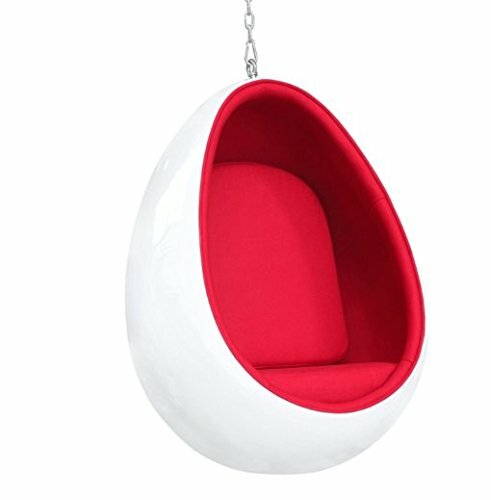 *This is a gorgeous white egg-shaped hanging chair with a bright red fabric interior! 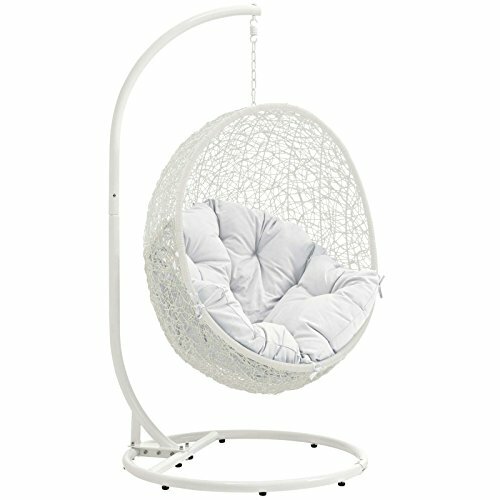 Great to have it in your bedroom to listen to music or read when you feel like spending some quiet time by yourself! Cannot think of a better way to relax! Can you see yourself inside this cozy egg shape chair? 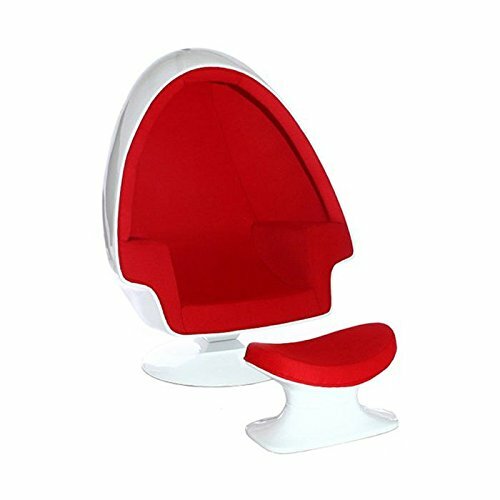 How about this cool Red and White Egg Shaped Chair and Ottoman? Who wants to make your living-room ultra-cool and stylish today? Just get this awesome bright red fabric classic egg-shaped chair and ottoman for your home! How cozy and inviting is this cool egg-shaped chair and ottoman with a beautiful all red interior folks? If you want to give your living-room a cool and ‘futuristic’ look, then I really recommend getting one of these cool looking ‘pod’ egg-shaped chairs! They are definitely one of the coolest chairs around! Just imagine yourself reading a book inside your cool egg! It goes super well with a white living-room! This happens because of its unique egg chamber shape and the upholstered interior! Can you imagine having two of these in your living-room? When you have a guest each one of you can relax and catch up from inside your relaxing egg chair! This cool and unique rattan egg-shaped chair with stand for sale is perfect to have on your porch or garden! It is made from weather-resistant and water-resistant materials! It does include the cushions too! It must be great to close your eyes and listen to music! 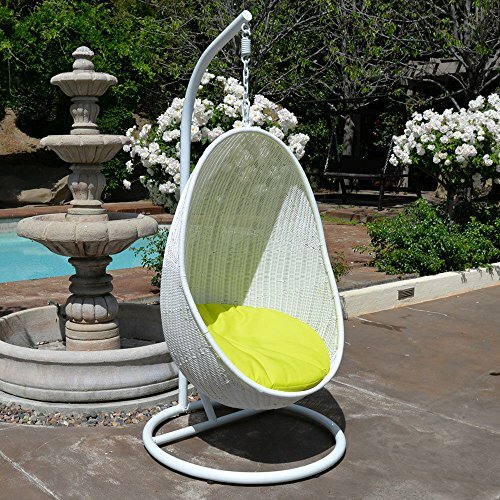 It is made of synthetic rattan and it is perfect to have outside on your favorite reading or relaxing spot! *The weight limit is approximately 264 lbs. How gorgeous and stylish is this Arne Jacobsen egg leather chair? Retro looking but at the same time very modern, this unique chair will definitely complement your living-room decor! This gorgeous egg chair is a mixture of retro and modern, all in one! It is made of 100% of the finest Italian leather and it is all hand sewn! I love this caramel color. Also great to have in your home office or even bedroom! 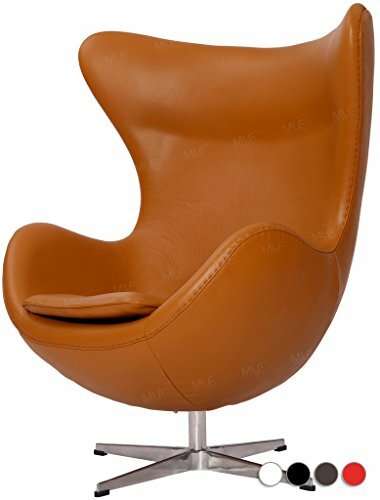 Gorgeous ‘cracked egg shape’ caramel color leather chair! Looks just like the original ones from the past! You can also get it in several different colors! I think it’s the perfect piece to add an air of ‘old meets new’ in your living-room! Great gift idea for moms too! That’s what I’m talking about folks! Every day will feel like ‘vacation day’ at home! 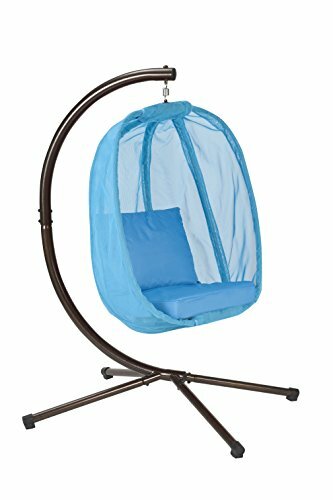 This fun blue egg-shaped hanging chair with comfy cushions inside looks so inviting! What a fun way to read a book or just enjoy the outdoors! *Did you enjoy these egg chairs? Cool BUBBLE Shape Chairs and Ball Chairs! Hello there, just click on the pictures. Thank you!